•et; Deck hugging snag free design. •et; Unit can be mounted horizontally. •et; Luxury chrome finish over marine grade bronze. •et; Capstan features heavy duty knurled finish for increased grip. 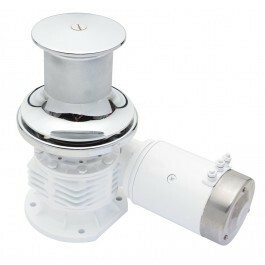 •et; Heavy duty dual direction motor in 12V and 24V DC, AC & Hydraulic. •et; Vessel Length: 14, 15, 16, 17, 18, 19, 20, 21, 22. •et; Max Line Speed: 15m\/min. •et; Chain Size (MM): 0. •et; Rope Size (MM): 12, 19. •et; Net Weight: DC 25kg HYD 23kg.